To celebrate the release of A Summer in Europe, I took a trip around the blogosphere, writing about some of my favorite personal European travel experiences. Below is a collection of highlights from some of those posts as well as some of my real trip photos. Hope you’ll enjoy them, and Bon Voyage! 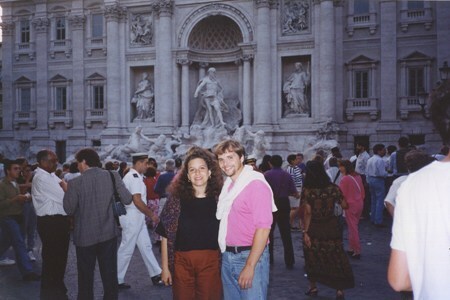 For me, the Italian capital holds a lot of personal memories because I did some of my graduate work there in the summer of 1994, alongside my new husband. 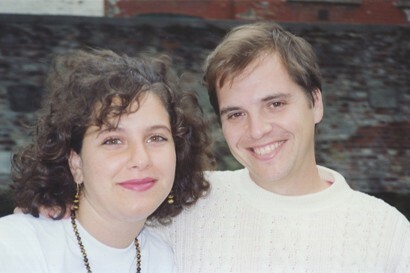 We’d been married just over a year then, so we got to stay together as “roommates” in this little dorm room on Loyola University’s Rome Center Campus. Hard tile floors. Separate twin beds. No air conditioning. (It was July…we ended up buying a small fan, LOL.) But we were used to living in a one-bedroom loft apartment in the Chicago suburbs, so we didn’t really mind. Plus, we were in the heart of Italy! An easy bus ride away from the Vatican, the Colosseum and my favorite historical oracle: The Mouth of Truth (pictured below with my husband). In Italian, it’s La Bocca della Verità. Anyone remember that scene in “Roman Holiday” where Gregory Peck takes Audrey Hepburn there? A favorite classic film moment for me! One of my most romantic (and delicious) Roman memories was a night when my husband and I went out to dinner with a small group of fellow students. It was a tiny little place, tucked away on some downtown sidestreet. Charming and intimate, we were served a creamy mushroom risotto that I still consider The Best Risotto I Ever Tasted. I have no doubt it had 9,000 calories, but if I can still remember it almost two decades later, you know it was good! (Here’s a Gourmet Mushroom Risotto recipe that just might come close, though!) And another memorable moment was making the traditional “three wishes” in Trevi Fountain. One of those wishes was “to come back to Rome,” which we later did! “Travel Addict” – not a bad moniker. Can you share a favorite “thing” you experienced in Australia,England and Italy? Absolutely! I’ll do the first two very quickly and the third more leisurely: Australia — holding a koala!! England — taking a class on Jane Austen! 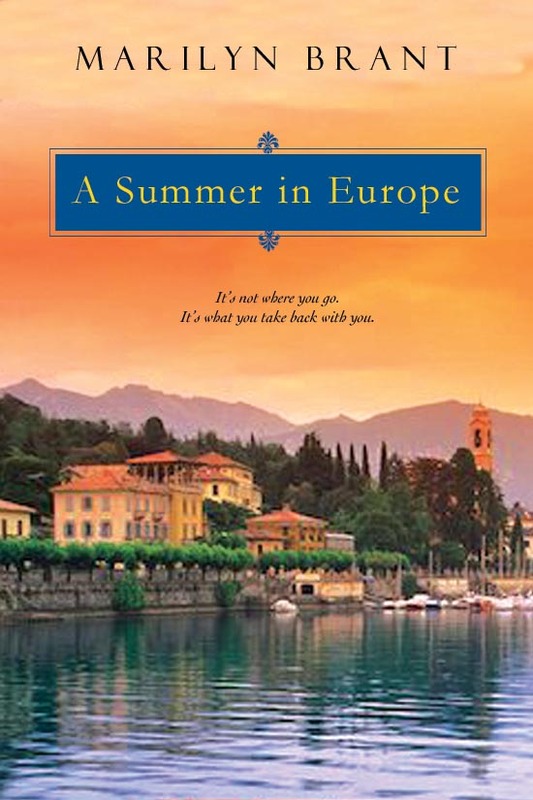 As for Italy…well, right now, because I’m in the midst of a blog tour for A Summer in Europe, I’ve been talking a lot about my travel addiction and my favorite memories abroad. Whenever possible, I’ve been trying to share a more indepth experience about a different European city on each blog, so it’s kind of like a travel tour as well as a book tour. 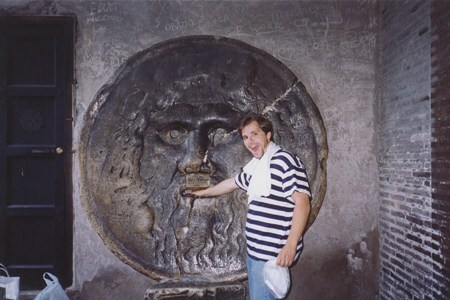 Since my characters start their journey in Italy, I’ll tell you one of my favorite sites that I’d visited was Pompeii. (There are two photos of my husband and me — one of us next to Mt. Vesuvius and one standing in the middle of Pompeii — both were taken back in the early 1990s…) I appreciated the incredible history of the place — you could really see hints of what some of the ruins might have been like when they were large standing buildings there, almost 2,000 years ago! We were also in the shadow of Mt. Vesuvius, and it was altogether too easy to imagine the tragedy of that famous volcanic eruption. And one fact that I found particularly fascinating was how their walkways had small tiles, called cateyes, in the ground, which would catch the moonlight or candlelight and help to illuminate the paths of the long-ago residents. Amazing to me how well-planned their city had been! Tell us about A SUMMER IN EUROPE – what inspired it? A couple of things combined were what first inspired the story. For one, I’ve been a fan of E.M. Forster’s A Room with a View since I saw the Merchant & Ivory production back in the mid-1980s and read the novel. So, I wanted to write something that had overtones of that book but was a thoroughly modern story. I also did quite a bit of backpacking through Europe and a few bus tours with my husband in those years before we became parents. So, I had all of these impressions of cities I’d loved and a collection of experiences (not to mention all the foreign chocolate & ice cream I’d tasted…), and I very much wanted to show the power of travel in opening up a character’s mind and getting her to look at her life anew. Additionally, it was an opportunity to highlight more than “a few of my favorite things,” to quote The Sound of Music song. My characters got to visit sites I adored, listen to music I’m crazy about and taste test dishes that make my mouth water. It was a pure pleasure to write this book! 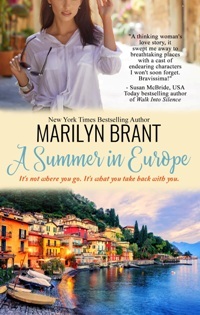 One of the places in the book that became the site of a turning-point scene for Gwen was her visit to the gorgeous Isle of Capri. It was a place I’d heard about only vaguely until my husband and I went there as part of a tour of Italy when I was about 24. Like my character, I only spent a day on the island, but the beauty of the place stayed with me. Even now…almost 20 years later. But it wasn’t just the flora that struck me as amazing. It was the fact that, while the island was covered with so much beauty, the sea around the island was equally stunning. Capri is just a short ferry ride from the coastal Italian city of Sorrento, and the waters are warm and semi-tropical, especially in summer. Tourists would line up to visit the Blue Grotto, a sea cave and admire the incredibly blue water inside of it, thanks to a lovely trick of the light. Another memorable thing about the island was all the walking paths. Many were not as seemingly level as the one in my husband’s photo. There were quite a few steep slopes and staircases, which gave us a good cardio workout while we were there! Despite the physical exertion, however, we would have loved to have stayed longer, if we could have afforded it. 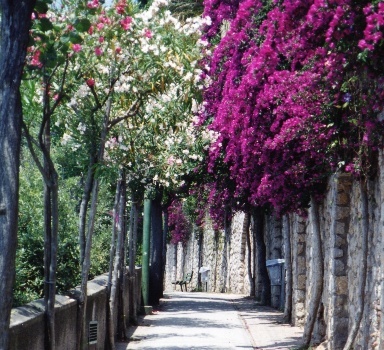 As it was, though, the day trip was very memorable and, in picturing my character there, I got to imagine myself running down the staircases, gazing out at the beautiful water and breathing in the Bougainvillea-scented air, too. And aren’t moments like that one of the many joys of being a writer?! I don’t remember now what I’d read or heard, exactly, that first convinced me I hadn’t fully lived until I’d seen Venice, but it became a persistent, almost tangible desire. I strongly recall a physical, pit-of-my-stomach ache in junior high because I’d wanted to look at it with my own eyes so much, and I was just too young (and too well supervised by my parents and teachers) to escape and fly there on my own. But the desire haunted me until, at last, I finally saved up enough to go there in the summer of 1992. 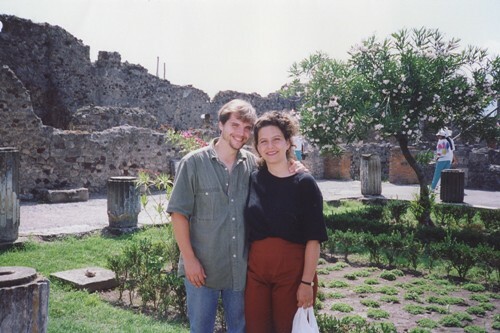 My husband-to-be and I were taking our first “Grand European Tour” together, a mostly Eurail/backpacking/cheap-food-and-hotel kind of vacation that my twenty-something wanderlusting self couldn’t wait to experience. That summer, I visited many of the major cities of Europe, but the one I was most anticipating was, of course, The Venice of My Imagination. There are times — particularly for creative types, I think — that the reality of something fails to live up to the brilliance of the vision. As our waterbus/vaporetto cut through the Grand Canal and curved toward St. Marco’s Square, I feared that would be the case for me. 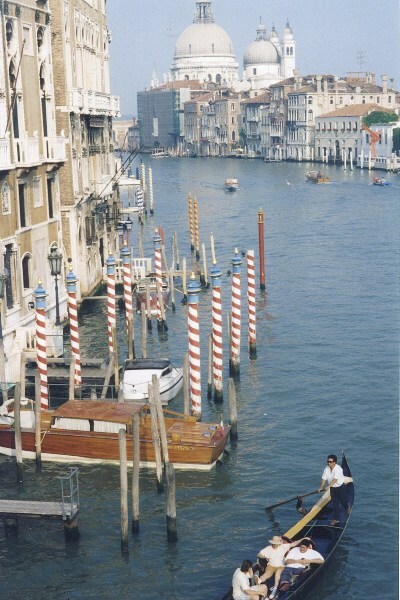 I’d daydreamed about my first real glimpse of Venice for so long… How could an actual city — even one built on water with those cute red and white poles sticking up and gondolas everywhere — possibly exceed the high expectations of a fantasy? It did in all the same ways that love eclipses infatuation. Venice is not a city without faults. Sometimes it floods. Sometimes there are unpleasant odors. Sometimes the buildings aren’t well kept up. Sometimes the signs are so confusing that there’s no way to follow them. Sometimes vendors will try to raise their prices on tourists that they think can’t read Italian…or do basic math. But, hey, sometimes my husband forgets to rinse his dish in the sink. Sometimes he screws the lid on the soda bottle so tightly it’s impossible for me to open. Doesn’t stop me from being glad I married him almost two decades ago. Some may have left their hearts in San Francisco, but mine? It’s wandering across the Rialto Bridge, loitering alongside the pigeons in the middle of St. Marco’s Square, perusing masks in artsy shops on those twisty sidestreets, riding on a gondola at twilight with the man I love. Gwen could scarcely imagine a place more foreign-sounding than Budapest. Not that it looked vastly different from some of the other splendid European sites they’d visited already, she decided, as they crossed the famous Széchenyi Chain Bridge, which traversed the Danube River and divided the antiquated cities of Buda and Pest. But Hungary was really far from Iowa. I’d done a fair bit of traveling outside of the U.S. before I’d ever set foot in Eastern Europe but, even so, I grew up in Wisconsin. (LOVE Wisconsin, by the way! I go home whenever I can. But “dairy state” comes more immediately to mind than “international mecca.” 😉 As a high school kid, there were very few places on the planet that sounded more exotic to me than Budapest, although I always thought Montevideo seemed pretty far away, too. Or Kuala Lumpur. These were the kind of places you’d read about in National Geographic, not the kind of vacation spots people in my circle of acquaintance would visit. So, when we first got to Hungary, I was very conscious of doing a lot of comparing and contrasting in an attempt to figure out once and for all just how “foreign” the city really was. But there was one memory that was impossible to capture with a camera or even by hanging onto the evening’s program: a German operetta that my husband and I serendipitously stumbled upon at Vigadó Concert Hall, featuring the songs of both Austrian and Hungarian composers. In the book, I gave my characters this entertaining experience, even including a few of the specific musical numbers that we’d seen performed. But theirs was a planned excursion—something their German-speaking tour guide organized for them in a city where there’s a strong cultural value placed on the sharing of music. I wrote this event into my novel because, quite frankly, I felt something important would have been missing otherwise. I just couldn’t think of Budapest—couldn’t write about it authentically—without remembering the magic of that night’s performance. And it was magical, despite the fact that I knew only a handful of words in German (Wienerschnitzel and Volkswagen being two of them) and none at all in Hungarian. It was magical because of the almost tangible enjoyment of the crowd for these songs. Because of the energy and feeling of rapport between the performers and the audience. And because—even though my husband and I couldn’t understand the lyrics—we were fully accepted by the people sitting around us. They could tell we appreciated the show, and the feeling of joy that permeated the atmosphere of the theater reminded us all how easily music could transcend language and cross cultural boundaries. Budapest wasn’t really all that “foreign” after all. After the performance, when the man sitting to our right turned our way in sheer jubilation and said enthusiastically, “Wunderbar!” My husband and I nodded in absolute agreement, and said,“Wunderbar!” just as enthusiastically right back to him (another of my few German words, but a perfect one for the situation). And I could never forget that short but meaningful exchange. These many years later, I gave that same expression of delight to the tour guide in my story—a man who was in raptures after listening to an operetta sung in his native tongue. It might be a small writing detail, but it was the truest expression of emotion I could find for that moment. My main character, Gwen, is a junior-high math teacher who is unaccustomed to foreign adventures or, really, to dealing with anything outside of her ordinary routine. While she’s abroad, she starts out very much as an “accidental tourist,” trying, like William Hurt’s character in the film by that name, to regulate her environment. To control it. To keep herself from being too affected by it. She’s also a bit naïve about love, similar to E.M. Forster’s heroine, Lucy Honeychurch, from A Room with a View, whose world is altered immeasurably by a visit to Italy. Like Forster’s Lucy, Gwen’s first impressions of Italy (and the unusual people she meets on her trip) spark the initial changes in her outlook and set her on a path quite different from where she’d been heading. She absorbs the highlights of Rome, Pompeii and the Isle of Capri, but as their tour bus zips toward Tuscany, I know she’ll be entering an ideal place to have a key realization or two. In fact, I couldn’t have made up a European city that was better equipped to inspire a personal rebirth—both literally and symbolically—than the actual Birthplace of the Renaissance: Florence. As writers, I know you’ll know what I mean right away when I say this, but I spent hours sifting through my memories of that city for significant details. 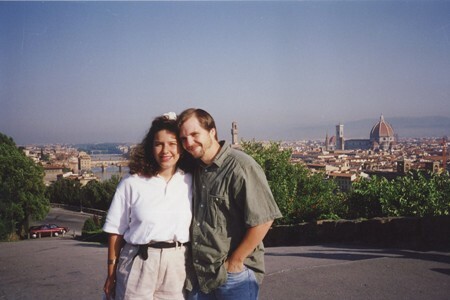 I haven’t been back to Italy since 1997, so I invested no small amount of time lurking on Italian travel web pages and flipping through our old photo albums. I ate lots of pasta and gelato for inspiration. (Hey, I’m nothing if not a slave to my art.) And I repeatedly walked my main character through my mental map of Florence, considering each of the major sites—and some of the minor ones—trying to figure out which would best reflect the sense I was hoping to create in that chapter: the growing revelations of a woman who’d vowed to begin her life anew. What would she see that might make her question her old ways of doing things? How would she interpret the classic art, architecture, history and culture of a city so much older than her Midwestern American hometown? Which sites would have specific relevance for her and, most of all, why? During the course of Gwen’s visit, she gets to make stops at quite a few of these sites. She reacts in her own way to each of them and, slowly, begins to show changes in her thinking as a result. She also begins to collect mementos and memories—both of which she’ll carry with her throughout the rest of the trip. To me, it was important to have her not only learn something new during each phase of her journey, but to have a token that would remind her of that lesson later. Because, of course, there will be conflict ahead (!! ), and she’ll need to remember what she’d learned. So, in Florence, I gave her a very specific object, something tangible that she could purchase and take with her, knowing it would emotionally rocket her back to that time and place whenever she would look at it. And I knew for sure that this would be true…because I gave her something of mine. Something I personally found on a visit I took to Italy, which I then brought home with me. I still have it. Back in the mid-1990s, my husband and I were window shopping on the Ponte Vecchio, the historic bridge that spans the Arno River. You can see it in the photo of us above—and, yes, that picture is from the ‘90s, too. (How young we were!) The merchants on the bridge are known for selling gold jewelry, so we saw lots and lots of items fashioned beautifully out of 24-carat gold, including some famous landmarks from around the country. There was a necklace with a finely tooled pendant shaped like the famous Duomo, the signature image of the city (it’s on the right-hand side of that same skyline photo). There were cases of pins and broaches featuring my favorite sculpture—the David. I remember a golden replica of La Bocca della Verità—aka “The Mouth of Truth”—which had been one of the most charming sites we’d visited in Rome. And there were quite a number of earrings, pins and necklaces in the shape of Venetian carnival masks, which I happen to love and collect in their full size. I bestowed upon Gwen a similar shopping excursion on that bridge and, in the course of her Florentine retail adventure, she purchased one of those items. I won’t tell you which piece she chose specifically, but it was something she ended up wearing throughout the remainder of her trip. For her, it became a personal touchstone from that day forward—an object she could tap with her fingertips and remember something important that she’d just begun to learn. To me, this is where our travel experiences and our fiction writing merge. We could go anywhere for story inspiration—it doesn’t have to be a place that requires a passport—but, as writers, I feel we need to bring with us our deepest awareness because we don’t know when we’ll be called upon to share a memory or a memento with our characters. I bought a lot of little things in Europe (my husband would be the first to tell you just how many! ), but not all of them are items that would have any meaning to Gwen. Were I to take another character with me to Florence, I’d have to walk through the city all over again, sifting through different details in hopes of finding the ones most significant to this new character. In some ways, it’s like getting to revisit a favorite place with your child. You get to see it anew through their eyes. And even getting to remember—in such a personal way—a city I haven’t seen in 15 years was, for me, very much like taking the journey again, too. Today I’m giddier than Lydia and Kitty around a regiment of redcoats. Really! I’ve been looking forward to the release of A Summer in Europe for so long, and the past week has been a thrilling and exhausting rollercoaster of excitement. But I’ve been particularly anticipating getting to share the launch here on AuAu because, next to According to Jane, this novel is my most Austen-esque. Some of you know a little bit about the book already. It’s the story of junior-high math teacher, Gwendolyn Reese, a woman unaccustomed to foreign adventures or, in fact, to dealing with anything at all outside of her ordinary routine. As a 30th birthday gift, her eccentric Aunt Bea gives her a “grand tour” of Europe in the company of Bea’s lively Sudoku-and-Mahjongg Club. Not Gwen’s first choice of travel companions, let me tell you! But, still, she decides to go. While abroad, she starts out very much as an “accidental tourist,” trying to control her environment and keep herself from being too affected by it. She’s also a bit naïve about love, similar to E.M. Forster’s heroine, Lucy Honeychurch, from A Room with a View, whose world is altered immeasurably by her own visit to the continent. So, of course, it goes without saying that Gwen is going to have a lot to learn over her five weeks of traipsing around Europe — about life and about love. Many of you also know that I’m a big fan of traveling. 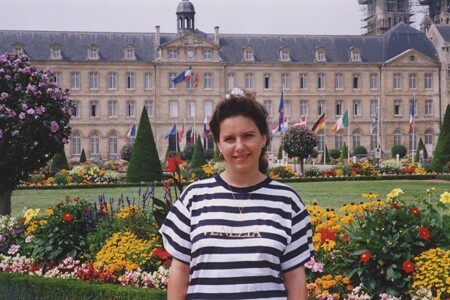 Since becoming a mom 13 years ago, I haven’t been back in Europe (I’d love to go again! 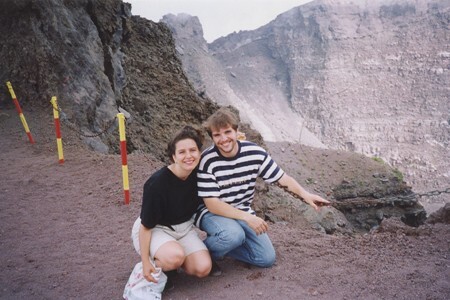 ), but my husband and I were both teachers during our dating years and our early marriage, and we took several backpacking trips abroad over our vacations. With very few exceptions, I’ve seen all the sites mentioned in the book, and I’ve been celebrating the story’s release by giving to readers a little piece of that journey. For more than a week now, I’ve been on a travel/book blog tour, talking about personal memories from many of the novel’s major sites. Today — because it’s Austen Authors, after all! — I wanted to share a romantic memory or two from a city I think many of you will especially appreciate: London. 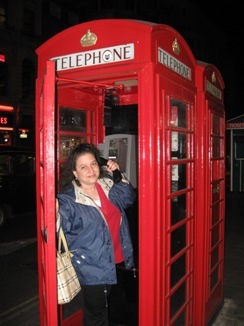 So, I have some very happy memories of London. It was also there that we visited the Globe Theatre (though they were still in the process of reconstructing it then), Buckingham Palace, Big Ben, the Tower of London and the British Museum — all sites that Gwen would get to see on her tour. And we even went to a gorgeous production of “The Phantom of the Opera,” something my music-loving heroine very much wants to see while in the English city… I don’t blame her. I was blown away by it and, ohhh, to be able to sing like one of those amazing stage performers! How flawless their voices sounded!! I’ve been celebrating this new book by taking a journey around the web to share some of my favorite European sites and to explain how my own real-life memories from visits abroad influenced the writing of this novel. What most of you might not know is that it was an email conversation with Robin that first gave me the idea to do this!! (Hugs and thanks to you, lovely Ms. Bielman!) The place I get to talk about today is where I saw one of the most breathtaking vistas in all of our travels—high up in the Alps surrounding Salzburg—and it’s also the spot where I got to get a little closer to two of my musical idols: Julie Andrews and Wolfgang Amadeus Mozart. Now, I should tell you, I saw The Sound of Music for the first time when I was in 3rd grade, and I immediately wanted to be Maria von Trapp and/or Julie Andrews. (In my young mind, they were interchangeable…although, I’ll confess, I did not want to be a nun, but I pretended I was the later Maria/Julie, when she was frolicking around Salzburg with the kids and singing songs about goatherds…) The Alps looked absolutely stunning onscreen, and I’d dreamed from that night onward of someday getting to see them for real. 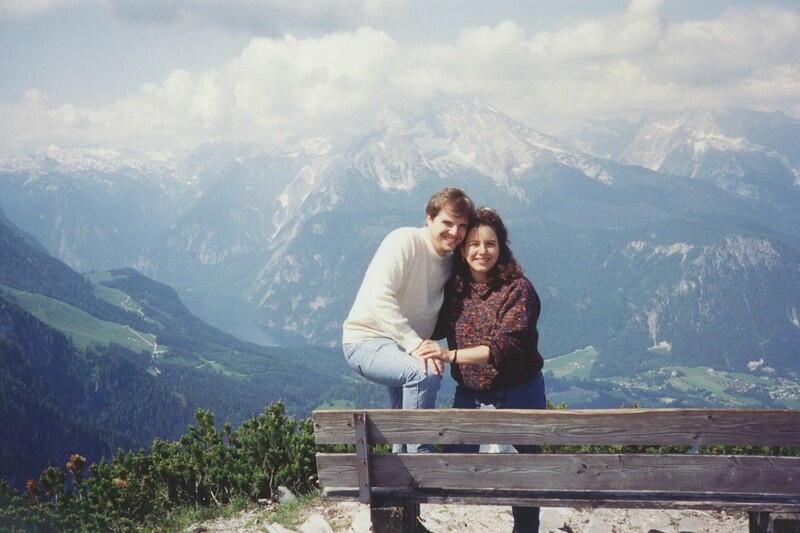 So, fast-forward about 15 years: a couple of months after my husband and I got engaged, we took a trip to Europe and ended up staying in the city of Salzburg for five days. (This was the longest we spent in any one city during our first summer’s backpacking excursions, btw, but we discovered really inexpensive lodgings and there was just so much to do!) At the youth hostel where we were staying, we met a couple our age from Australia, and the four of us hiked up to Hohensalzburg Castle, a fortress built on a hill that dominated the view of the city. We walked through the town of Salzburg, visiting Mozart’s birthplace/home, taste-testing weisswurst sausage that was grilled and sold in one of the squares, and window shopping while student musicians played their violins on street corners. And we went on two tours—the first was The Sound of Music tour, complete with a trip to Mirabell Gardens (used in the “Do-Re-Mi” song from the film), the gazebo (“Sixteen Going on Seventeen”), and the lake, which was used on the set as the backyard of the von Trapp family home in the movie. (Remember the falling-out-of-the-canoe scene?!) I couldn’t stop humming “the hills are alive…” for an entire week. I couldn’t highlight all of the places we visited on my heroine’s tour of Europe, but I specifically included The Sound of Music and The Eagle’s Nest tours because I felt they would be sites her tour guide would have taken the group and, also, because they simply were—wait for it—a few of my favorite things, LOL. 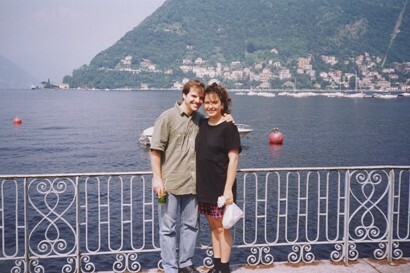 The first time I went to Lake Como, I was 19 — a few years before I met my husband and a full five years before this photo above was taken. I’d been a part of a college dance group that first time, and we were representing the USA at a large folk dance festival in northern Italy. We entered the country from Switzerland, not stopping at any large cities or seeking out the well-known landmarks, and we stayed for a full week on the outskirts of Como. During the day, we were in parades and we hung out with the dancers and musicians from other countries — talking, flirting, eating truly enormous quantities of gelato — and during the night we danced. It was great fun, but it was also a little difficult for me to be so very close to Venice, Florence and Rome and NOT see ANY of those cities on that first trip… I did, however, see the lovely city of Como. And I can tell you now, that alone was enough to ensure my desire to go back. Not only so I would be able to explore the rest of Italy, but specifically to return to the beauty of the Italian Lake District. I knew exactly what I was going to do when I got back there again. I was going to relax in the sunshine and stroll along the floral walking paths. I was going to sit at a quaint cafe in the middle of town, scuffing my sandals at the uneven stone beneath my feet. I was going to admire the water sparkling in the daylight and imagine what it must be like to live in one of those pastel-colored hillside villas. When I did return, however, it was with my new fiancé — a man who had a very different idea of “relaxing.” We did stroll for a while along the paths. We did eat something at a cafe (I remember a rather delicious ravioli one night). And we did admire the the gorgeous lake. But my husband-to-be was a man of action, and he didn’t really want to stay on the gentle walking path. So he talked me into going for a pedalo ride one afternoon on the lake — peddling this little, reddish, floating contraption that required a bit more of a cardio workout than I’d been anticipating. But that still wasn’t enough activity for him. No, we’d no sooner docked our pedalo boats when he started talking about seaplanes with the owner of one who was standing near the shore. Initially, I just thought it was a guy thing — “Oh, look! Something with an engine! How fast does it go?” — but I was wrong on that. My husband’s father is a pilot. A former Thunderbird from WWII, in fact. His son didn’t just want to TALK about the plane, he wanted to get in it. And he wanted me to get in it, too. My attempts at resistance (“Um, isn’t that kinda dangerous, honey? We don’t know enough Italian to deal well with a medical emergency…”) were pretty much ignored and, once I’d made it through lift off, I forgot my own hesitations. If I thought Lake Como looked beautiful from the ground, it looked simply gorgeous from the air. These days, if I’m remembering the tabloid details correctly — and if they’re true, LOL — George Clooney has a villa somewhere in the area. (We’ll visit him next time.) But you don’t have to be a handsome, multi-millionaire actor to feel like a celebrity walking (or flying) around this stunning lake. It just happens that you will. 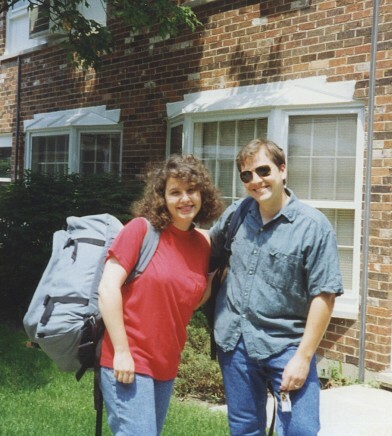 My husband and I were both public school teachers in the 1990s so, before becoming homeowners or parents, we would go on these backpacking trips together for weeks at a time. For a several summers we traveled to Europe, stayed at cheap hotels or youth hostels, Eurailed to different sites, walked for seven hours or more on most days (sightseeing is great exercise!) and lived on pub food in England, bakery pastries in France, chocolate bars in Germany and gelato in Italy. Definitely my kind of vacation. Anything with chocolate! Well, okay, there are some things dipped in chocolate I wouldn’t eat (i.e., crickets, celery, any kind of fish…ugh), so I’ll amend that: ALMOST anything with chocolate! If you were given a chance to travel to the past where would you go and why? There are so many historical figures from the past that I’d love to meet in person…or even observe from a nice safe distance (was Attila the Hun *really* that bad?! LOL), but from a literary standpoint, Jane Austen was always my idol. So, it would be fascinating to return to England of the early 1800s to meet her for tea. I listen to music on my iPod — too loudly, I’m sure. And, when I’m feeling motivated and the weather isn’t keeping me inside, I love to listen to the music while walking. My heroine in this new novel loves Andrew Lloyd Webber musicals (so do I), so I listened to a lot of soundtracks while writing it — especially The Phantom of the Opera. Strawberry daiquiri or a beer? Strawberry daiquiri, hands down (although, I have a hard time *spelling* “daiquiri…). I wish I liked the taste of beer a bit more. I used to live in La Crosse, Wisconsin — home of the G. Heileman Brewing Company, the makers of Old Style Beer — and they had the world’s largest six-pack right in front of the building back then. I was an undergrad in college at the time and EVERYONE I knew loved beer… I loved it only as a helpful cooking ingredient for beer bread and beer brats, which are both delicious, by the way! I love the settings in A Summer in Europe. Which location was one of your favorites? How many of the places your characters visit have you actually traveled to? But probably the oddest memory that stuck with me through the years was that, at our little hotel in Nice, someone had left a romance novel in the room. It was in English and, when I tried to turn it in to the lady owner, she told me to keep it. I later gave it to someone else I met on the trip and have since long forgotten which author wrote it…but I’ll never forget that I was compelled to read it. That I was visiting a lovely and romantic place and was also enjoying a story that was as lovely and romantic. It was like being in two wonderful places at once. And I really loved that, even though I’d had no idea at the time that I’d ever write a romantic story myself. You all should know, there are so many places in Italy that I love…and I am, in no small way, envious of Maria Grazia and anybody that has the pleasure of living there! My husband is half Italian and one of the places we visited in the country was the Liguria region (on the Italian Riviera) where his mother’s side of the family came from originally. It’s actually not far from the city of Pisa so, while we were touring through Italy, my hubby and I visited Florence, zipped over to Pisa, then headed northward along the scenic/coastal Cinque Terra, saw the area where my husband’s grandmother was born and, finally, caught a train northward toward Genoa. 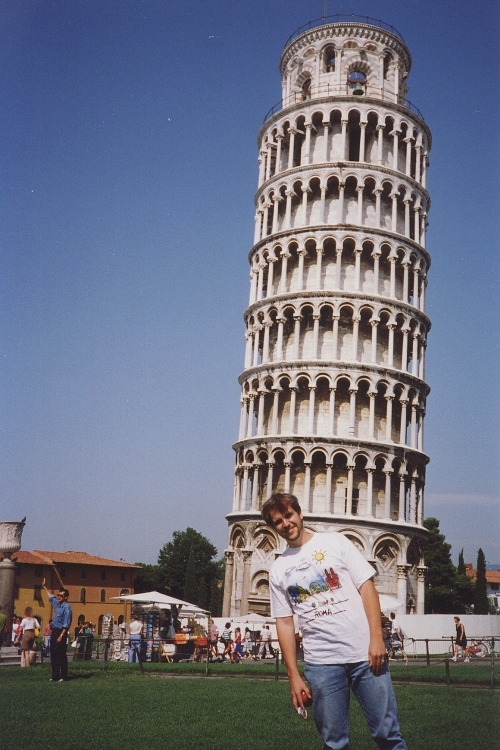 In the book, my characters visit the city of Pisa and, of course, the impressive and very well known landmark, The Leaning Tower. It was a structure I grew up hearing about from my dad because he spent a summer working odd jobs in Europe before starting college and The Leaning Tower was a site he recollected fondly. He passed his keen interest in it to me, and I couldn’t wait to see it with my own eyes! In my novel, one of the elderly tour-group members gets the idea to start writing a thriller in the vein of J.D. Robb, and she’s speculating with another tour member in the story about how best to kill off one of her characters. In real life, I didn’t do that! (But only because I write comedies, not thrillers, LOL.) I didn’t even get to go to the top of the tower because, at the time we were there, restorations were in progress. So, my hubby and I spent at least an hour trying to take the perfect picture of this cool landmark—either pretending to “push” it or in some way call attention to the fact that it was leaning. The photo I included below is actually one of my favorite shots of him in Europe. He’s mastered the look of touristy cluelessness and, really, every time I see it I can’t help but laugh aloud. Upon arriving in Pisa, Davis, Dr. Louie, Kamesh and Ani immediately began debating the Leaning Tower’s degree of tilt from the ninety-degree perpendicular. “It looks to be about a five-degree angle,” Dr. Louie guestimated. Davis whipped out his pocket protractor—yes, he actually carried one with him!—and held it up so he could gauge the correct angle from a distance. “We learned in school that it was a little less than four degrees,” Ani said. There were 294 steps on one side and 296 on the other, to be precise. She smiled back at him but waved him off. She didn’t feel like racing against anyone that day, not even herself. Instead, she hung around the grassy square, strolling past Pisa’s Cathedral and the Baptistery, drinking in the site of the famous landmark and the sunshine. She watched and, yes, eavesdropped on two married couples this time—Connie Sue and Alex, Sally and Peter—as they sat on a shady bench on the edges of the square and discussed the date the tower was built, who was in political and religious power at the time, what the history surrounding the construction and reconstruction was like and so on. Aside from their professed delight in finally seeing such wonders in person, there was also a constant search for meaning within the numbers and patterns that made Gwen pause. “It took 177 years to build in 3 stages and work was first begun in 1173…all 1s, 3s and 7s!” Sally exclaimed. “And the same pope, Alexander III, that led the Church when they were breaking ground on the Leaning Tower also laid the foundation stone for Notre Dame in Paris,” Alex added enthusiastically. On one level, Gwen found it funny—this incessant DaVinci Coding of Europe—but it also made her wonder what the point was of all the analysis. Like a game of Sudoku, wasn’t the puzzle merely an intellectual exercise? Even if a pattern could be found based on the scant clues given, it wasn’t as though it was the cornerstone to anything important…to any profound truth…was it? This story is about a woman named Gwendolyn Reese, who’s bright intellectually, but she hasn’t experienced much of life despite having just turned thirty. That’s about to change when she gets a month-long tour through Europe as a birthday gift from her eccentric Aunt Bea…and her aunt’s Sudoku-and-Mahjongg Club. They all fly from Dubuque, Iowa to Rome, tour through Italy, Southern France, Switzerland, Hungary and then cross the border into Austria on their way up to Paris, Brussels and London. By the time they’ve reached Vienna, Gwen’s been on the tour long enough to have gotten to know quite a few of her travel mates. In some cases, her first impressions were not quite accurate. In others, well, it turns out she was right to be on her guard! In my opinion, the middle leg of a Grand European tour is a whole lot like the middle segment of drafting a novel. You have a solid start and a general sense of direction. You’re getting into the swing of things and know the people/characters you’re dealing with fairly well, but there are still a lot of unanswered questions. Still waaayyyy too many loose ends to even think of winding down such a massive undertaking. So many miles remain and the only way to get from where you are now to where you’re headed is through…whether it’s writing scene-by-scene for a book or traveling city-to-city for a tour. For me, the very real Vienna has been a midpoint on two different backpacking journeys. I was always aware when I arrived just how far I’d already traveled and, likewise, how far I had yet to go. Since I write chronologically and go through a similar experience when working on a novel, I found myself quite literally structuring the story trip the way I might have structured a real one: The stages of travel and the stages of my writing about it were mirrored at nearly every step. It was almost more metacognition than I could handle sometimes, LOL. Like Budapest, Hungary, Vienna is a city on the edge of eastern and western Europe. I found myself constantly reminded of that, especially in the architectural design and the colors of some of the buildings. The roof of the Hofburg Palace (once the Imperial Residence of the Habsburgs and now the official home of Austria’s president), for instance, is particularly striking to me. I tried to explain in the book things like the vastness of the city—a capital packed with museums, famous buildings and gardens. My characters got to visit a number of places that I once went to, like Schloss Schönbrunn, Beethoven’s grave in the Central Cemetery, St. Stephen’s Cathedral and the major park, the Prater. But even aptitude wasn’t always a requirement. I play a little piano (very little, incidentally, and rarely well) but, after hearing so much music in town, I couldn’t keep myself from fooling around with the black grand piano sitting in a room off to the side of our hotel’s lobby. The place was deserted—just the one guy behind the desk in the other room, and it was mid-afternoon so most guests were out sightseeing. But within sixty seconds of me starting to play some pseudo-classical tune I was making up on the spot, an older woman sat down in the corner to listen to me (seriously?!) and the desk clerk left his post (why?!) and stood against the wall watching me and contemplating—I soon found out—what composer I was attempting to play. “Mahler?” he asked, confused but very politely. “Who wrote that?” Ha! My piano playing skills don’t warrant this kind of attention AT ALL, trust me, but the attitude of the city had seeped in… And it wasn’t about me or even about musicians, it was about a love of the music itself. Maybe because Romeo and Juliet were teens in their Verona, as I was a teen in mine, and maybe because they didn’t have the smoothest of adolescent love lives, a problem I could relate to altogether too easily, I’ve always felt a certain affinity for them and their hometown. The Arena di Verona is an amazing amphitheater. Unlike the Colosseum in Rome, the Arena is still in use today with operatic, musical theater and even rock performances being held there regularly (Sting, Pink Floyd and Muse have all done shows in the Arena). It’s home to the Verona Opera, and four productions are typically planned for every year between June and August with up to 15,000 people in the amphitheater at one time. Juliet’s balcony is, of course, a touristy fabrication, but it’s a delightful one, and the fact that Juliet was merely fictional in no way stops many of us from seeking it out anyway. My husband and I went there and snapped pictures along with dozens of other travelers, and the characters in my book did the same…all of us reciting at least a few of the lines from Will’s famous tragedy while staring up at that balcony. Standing in front of that balcony in northern Italy, I laughed, remembering my high-school romantic dramas, one of which had actually taken place while we were reading “Romeo and Juliet,” and appreciating the insight Will gave to us about teen relationships those many years ago. The dizzying power of infatuation. The allure of forbidden love. The irrationality of family tiffs. The ease of disaster at the hands of adolescents. The ties connecting the two cities in my mind were strengthened yet again. One of the interesting cities Gwen travels to in the novel is Brussels, a place I had the pleasure of visiting only once, but it was both a memorable and very enjoyable experience. I am, I’ll admit, a little envious of Nicole for getting to live there! My heroine’s activities in the Belgian capital and mine were a bit different, however. When my husband and I were there, we were backpacking through the country in our early marriage/pre-parental days and, so, ours was the very casual visit of semi-aimless tourists. For the purpose of my novel, though, my characters needed to have a little more direction than I’d had ;-). Their reason for visiting Brussels was specific to an event I created: an international Sudoku festival, which my heroine and her travelmates had planned to attend. It was completely fictional but, given the math motifs woven through the book, it became a short but important event and a turning point in the story of a couple of secondary characters. As a writer, it was a whole lot of fun to make up, too! I researched how Sudoku championships were organized in other cities around the world, chose a location in the Mont des Arts cultural quarter of downtown Brussels and learned that there were huge convention centers there that would be a perfect spot to hold an event like this. Hopefully, my fictitious festival ended up being fairly realistic in its depiction, but I’ve never attended anything like this in person. I’d love to go to one sometime just to watch! Another thing my heroine got to do was to see the Atomium while standing alongside another character who happened to be a physicist. I greatly enjoyed getting a glimpse of the famous monument myself, which was originally built for the 1958 Brussels World’s Fair, but I had no idea when I saw it that it was supposed to be an iron crystal magnified about 165 billion times! (My husband, who teaches world history, knew about many of the major historical sites in Europe, but neither of us had any background on this structure, and we ended up learning most of what we know about it after we got home.) If I’m ever fortunate enough to return to Belgium, I not only want a longer look at the Atomium, but I want to go inside of it, ride the escalators and check out all the cool exhibits. I’m sure, since I was only there a few days, I missed many important sites in the city, but I do hope we’ll get to go back someday… For now, though, my big international excursions are all virtual, LOL. For the past month and a half, I’ve been celebrating the release of my third women’s fiction book, A Summer in Europe (http://tinyurl.com/3qk8nt8), by taking a journey around the web and talking about some of my favorite European sites, specifically the ones that appear in the novel. I’d hoped to share a few personal memories of places I loved. Places that left an indelible mark on my heart and my imagination. Places that eventually came to inspire my writing. This story is about a teacher named Gwendolyn Reese, who gets a month-long tour through Europe as a 30th birthday gift from her eccentric Aunt Bea and her aunt’s Sudoku-and-Mahjongg Club. At first, Gwen has her hesitations, but she’s soon convinced to go and, before she can blink, she finds herself zipping through famous capital cities, tasting wondrous regional dishes, meeting unusual people and having her first foreign adventure. Throughout the book, Gwen visits Italy, France, Switzerland, Hungary, Germany, Austria, Belgium and England, and she finds her life changing in ways she never would have expected. One of the major cities Gwen visits late in the novel, and the place I’ve selected as my final stop for my blog/travel tour, is one of my European favorites: Paris. I usually hate to see a long trip come to an end but, if there must be a finale to the journey, the “City of Light” makes a lovely choice. 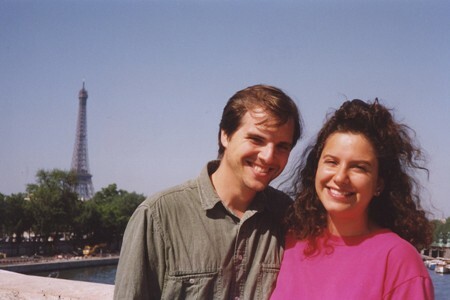 I’ve been fortunate to have visited Paris twice; both occasions were with my husband early in our marriage. Once upon a time, it had been the last city on our own grand European tour. We were concluding a six-week-long adventure—as long, in fact, as my virtual tour has been—though ours was very much a real one that happened in the mid-1990s. My husband and I backpacked that summer from Munich to Vienna, all the way around Italy and up through the Swiss Alps to northern France. We then spent our last three uninterrupted days in Europe crisscrossing through Paris in every possible direction. I still remember our hotel—a tiny inn near the Gare du Nord train station ($40/night for both of us, can you believe it?! )—which had creaky wooden floors, a shared bathroom down the hall and a charming view of a neighborhood Parisian street. After picking up a tart or quiche from a shop nearby for breakfast, we’d trek into the center of town for the day…sometimes strolling, sometimes racing through the famous sites. I got to spend a little more time in the Louvre than my heroine does (she’s only given an hour to view the artistic masterpieces, while I had about five hours) but it still wasn’t long enough. That trip inspired me to learn to paint, so I wanted to see as much art as I could in the city, especially the Impressionists at the Orsay Museum, the Mona Lisa at the Louvre and the famous Rodin sculptures—all amazing. My husband, a high-school world history teacher, knew far more than I did about Napoleon, the French Revolution and the various WWI and WWII military battles that had affected the country. So, we also went to Napoleon’s Tomb/Les Invalides, the site of the Bastille, the Place de la Concorde and other impressive landmarks like the Arc de Triomphe, Notre Dame Cathedral, Sacré-Coeur Basilica and the Luxembourg Palace and Gardens (the photo of me below by the flowers was taken there). All of this was done in between what I felt was our REAL Parisian task: to taste-test all of those great pastries!! Excellent advice for any writer, yes? Although the standards he sets are pretty high, LOL. Taking trips to incredible places—whether by plane, train or cushioned armchair—has always brought me great joy, and it doesn’t matter if it’s a flight across continents or just a road trip across state lines. Travel is, in fact, an antidote I’ve used to ward off the sadness and sheer frustration of living many times…and for decades before I ever officially became a novelist. I sent my heroine on a journey so she could do the same but, as the narrator of her tale, I have more responsibility than she does. I believe it is the job of the writer to see, hear, smell, touch and taste (!!) everything, and to feel a full range of emotions. But, then, we have to go a step further, letting our characters translate honestly those sensations and, ideally, find meaning and hope for all of us amidst the chaos. So, I think Woody, Ernest and Gertrude were onto something… If my story succeeds in transporting the reader on a genuine adventure, and if that reader feels just a little more hopeful about life at the journey’s end, I will, perhaps, have done my job. Getting to blog about books and travel is like getting to snack on both gelato and milk chocolate salted caramel squares… For me, it doesn’t get any better! So, first of all, many thanks to Andrea for inviting me to visit Great Thoughts today. It’s truly a pleasure. 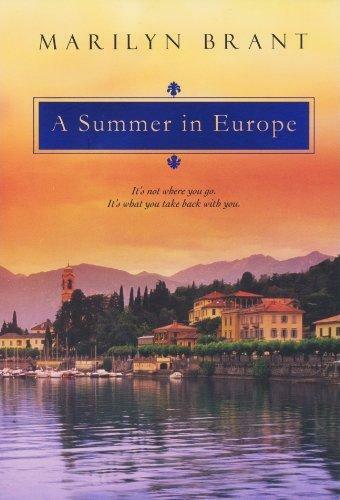 Being that I wrote a novel called A Summer in Europe and did, in fact, spend several summers abroad (back in those more carefree, pre-parenthood days), it’s no surprise to anyone who knows me that I love to travel. I always have. My family would be the first to tell you that my wanderlust predated even my love of writing. I got my first passport when I was two, and I haven’t been without once since, even when I couldn’t afford to travel any further than the borders of my home state—Wisconsin. But, while writers must typically go through years of apprenticeship to get to a place where they know their craft and have gained enough skill to juggle the elements of storytelling reasonably well, almost every novelist I know spent several decades simply observing. Seeing as a fiction writer…long before they acquired the narrative mastery of one. So, it’s been quite interesting for me, personally, to field questions about the writing of this new book. Many readers assumed I was in Europe recently or had actually done research for the novel while overseas. Oh, I wish that were the case! But, no. I haven’t been to Europe in almost 15 years. As I was working on some of the book’s chapters, I would invariably come upon a detail I needed that I either didn’t know or couldn’t remember. Wikipedia is an excellent tool in such instances! There are scores of European details that can be looked up online—from the floor plan of the Louvre Museum to the specific times hovercrafts travel between Sorrento and the Isle of Capri to the lyrics of an Andrew Lloyd Webber song and where, exactly, you can hear it performed live in London. At some point or other, I hunted for all of these and many more. But the part that couldn’t be Googled was my emotional reaction to the places I’d once visited in Europe, or the immense relief I felt at finally being able to do something creative with the images, sounds and sensations I’d perceived while I was there. For years, they’d been lingering in my mind. Haunting me, like the mocking ghosts of journeys’ past. I’d attempted a number of other forms of creative expression, hoping I might feel that I’d put these experiences abroad to some good use. I tried photographing major landmarks (the result was mediocre and frequently grainy), painting canvases of Venetian bridges and canals (I should not be allowed near oils), baking English scones (oh-so-dry…) and playing piano (my rendition of Mozart’s “Alla Turca” truly exemplifies the full meaning of “dreadful”). Instead, and at long last, I poured my love of Europe into a story, crossing fingers and hoping it would express what I couldn’t seem to say otherwise: That the Eiffel Tower sparkles in the darkness like a giant nightlight bringing glowing comfort to the city. That music fills the air in Vienna and Salzburg and inspires in passersby a desire to dance on street corners. That warm scones with jam and butter might just be the food of the gods. And that Venice is so magical my breath catches every time I think of it. Every time. I have to pause, just remembering. Wishing you all the joys of the season and many happy memories to warm the winter nights! For 15 years, I’ve dreamed of getting to return to Europe. I even wrote a whole book (known these days as A Summer in Europe) about a woman spending several weeks there, visiting cities from Rome to London and drinking in the amazing atmosphere of every fabulous site. I wistfully daydreamed my way through the creation of every scene… Most of all, I fantasized about getting to show my “baby boy” (who’s now a teenager) a few of the places I most loved across the pond. To take him to the spot where his dad and I got engaged. To introduce him to a few real castles, Jane Austen’s stomping grounds, the coolness that is the Tube and Cadbury bars made in the U.K.—because, yes, they taste different there and are SO VERY delicious. 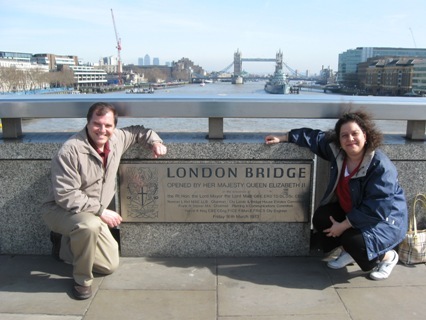 Well, a few weeks back, my husband and I took a look at both the calendar and our son…and we realized in shock that it had been 20 years since my husband proposed to me on London Bridge. 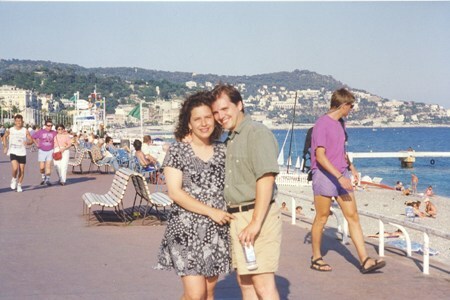 (Spring Break of ’92…sigh…where did the decades go?!) And that, in just a few more years, our son would most likely be away at college or have a job and little time for vacations with his old, sentimental parents. So, despite our busy work schedules, the difficulty in being away from aging family members (my father-in-law just turned 90) and the significant expenses involved, we did something spontaneous, impulsive and oh-so-exciting: We booked spring break flights to England! To say I was anxious and holding my breath that all would go smoothly is an understatement. I haven’t been abroad at all since 1997. That was pre-parenthood. Pre-9/11. Pre-homeownership. Pre-published authorship. Even pre-email!! (Well, pre-email for me—I didn’t begin really using the Internet regularly until I joined RWA in 2002.) Pre-digital camera, too, since I’d loved my old 35mm and hadn’t wanted to give it up. So, I knew times had changed and I figured I’d encounter a few major differences while we were away. Truthfully, though, the lovely England of my memories was much as she’d always been. 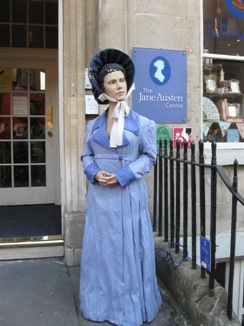 One might say, in essentials, she was unchanged… I did, however, get to have some new and thrilling experiences and, those of you here will appreciate these: visiting Winchester Cathedral, Jane Austen’s House in Chawton and the Jane Austen Centre in Bath!! The very nice Becca Hemmings, who runs the online Jane Austen Centre gift shop, was kind enough to order additional copies of According to Jane to make available for customers, and I signed bookplates for them so readers who might be interested can have autographed copies. I enjoyed a visit to the Centre while my husband and son toured the Roman Baths. 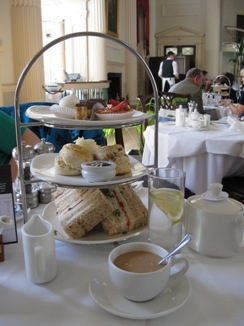 We celebrated our 19th wedding anniversary by having tea/scones at the Pump Room and then we wandered around the famous Royal Crescent and visited a number of wonderful little shops, including the bookstore where my husband had gotten me my 1894 “Peacock Edition” of Pride and Prejudice all of those years ago! We did many other things while abroad, too. My son—a castle nut—got to finally see some truly impressive ones. We Brit-Railed up to Conwy Castle in Northern Wales (gorgeous!) and visited the Tower of London (amazing!) and walked the walls of Chester (so cool!). We also went to the “Ceremony of the Keys” at the Tower of London one night, which is a tradition that dates back 700 years. (My world-history-teaching hubby was in raptures.) 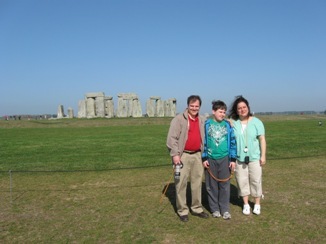 And we took trips to Stonehenge and Oxford, too. We rode on the relatively new Ferris wheel, called the “London Eye,” and saw the beautiful city at night, peeked in on Shakespeare’s Globe Theatre (next time I’m traveling in summer so I can see a play there!) and had fish-n-chips with vinegar at a pub, just the way I love ‘em. 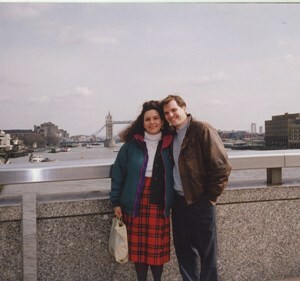 We also went back to London Bridge…so my husband and I could celebrate the site of our engagement and ask our son to snap a shot of the two of us, 20 years later. You can compare and contrast below!! I can’t believe our 9-day adventure flew by so fast, but it’s good to be home, if only so I can finally catch up on sleep and stop eating those milk-chocolate Yorkies with the raisins and biscuit bits as if there were no tomorrow. Someday, if we’re really fortunate, I’d love to do this trip again…perhaps with our (future) grandchildren for Spring Break 2032… I’m already saving up my pence for more Cadbury bars ;). p.s. What’s your favorite kind of candy bar??! I’m a Yorkie addict.